This will be my last 20 mile day. In late today. I am tired. I will update today’s events tomorrow. What a long day yesterday. Thank God my feet did not hurt again. 4 days in a row with Happy Feet. I can’t even begin to express my appreciation for feet that don’t scream at me with ever step. The only thing different is I have slowed my pace and shortened my distance other then yesterday’s 20 miler. We actually did 21 miles yesterday because we journeyed southbound half a mile without realizing it. We climbed to the top of Prospect Mt. And side stepped a few feet to the opening for a view and snack. Afterwards I proceeded to lead what seemed to be in the correct direction only to discover it was a blue Blaze trail. We double backed to the vista and picked up the white blaze again and continued wth me in the lead. After about 15 minutes of a downhill stroll we came to a road and a sign. I immediately felt my heart sink as I realized we had just traveled southbound for roughly 1/2 mile. So we turned around again and climbed to the peak again. Lots of mud again today. 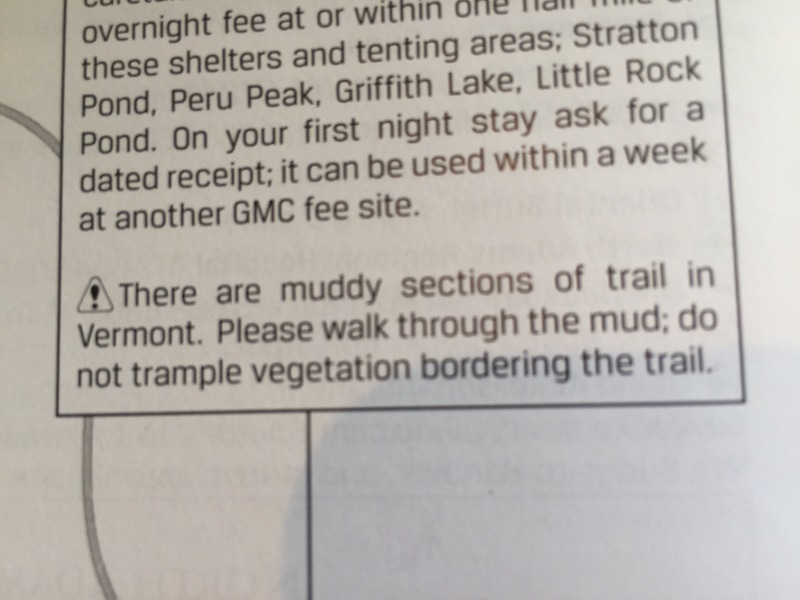 We were warned a few days ago by our fellow ancestor hikers about the mud. Even the guidebook hints of it. Batman met us at the shelter and was going to have the tent set up. That was the deal for me hiking 20 miles. I was tired when I finally strolled into the shelter area after 12 hours and 20 minutes of hiking. I couldn’t wait to get to my tent that Batman was going to have already for me. I was saddened when he informed me that he had the wrong fly for the tent and we had to sleep in the shelter. I survived thru the night, no mice or bugs. I was grateful. I didn’t eat supper. I just cleaned up in the stream and went to bed.